Road Champs Fly Wheels Rapid Fire Launcher and Ms. Pac-Man TV Games (Jakks Pacific) get reviewed by Hot Toys Thorough Review. This ripcord powered tire can be shot up over 25 feet in the air when maneuvered up the small ramp (sold separately). The design comes in about as many styles as actual tires, including street, racing, off-road and tuner. You don't need a console to bring home videogame excitement. 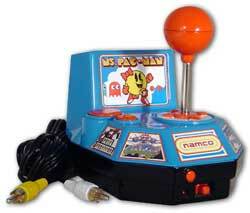 Simply plug it into the TV and you're ready to play five classic Namco games including Ms. Pac-man, Galaga, Pole Position, Xevious and Mappy, all designed to give you hours of fun - at an extraordinary value!